The first two lines remind me of a popular question – would you rather be rich or famous? Although here, we are asked to evaluate both fame and riches in comparison to our self. The character for self also means body, so we could make our evaluation in terms of our physical lives, or in terms of our identity or sense of self. The third line asks us to look at the effect of gain or loss on our lives. Most of us would prefer gain to loss, but if we examine our attachment to gain and our aversion to loss, we might see that both can cause anxiety. The message here is one of balance and equanimity. Fame comes and goes. Riches come and go. We receive and release. There is a point of equipoise where the self remains balanced, not seeking to force or interfere. Sometimes people misinterpret this to mean that we should just sit around doing nothing. That is not in harmony. When it is time to work, we work. When it is time to rest, we rest. We take responsibility for our lives. We provide for our families. We contribute to our communities. We can do all of that from a centered place of contentment and gratitude, knowing when we have enough, or have done enough. My sister is an artist, and I often wonder when she knows that a painting is finished. There seems to be a point where she has done enough, and more would be too much. She just knows. That fascinates me. I have a friend who lives in a gorgeous, palatial home, but is always worried about money. How can a person who lives in such luxury have such a joy crushing sense of lack? That fascinates me too. This chapter invites us to examine our own lives, to notice where we are out of sync, where we struggle hold the scales out of balance, and to consider the effort it takes to maintain our disequilibrium. Can we observe without judgment? If we can, then perhaps we can gain some insight that might allow us to release even just a little of that burden. Love this one. So well said: "but if we examine our attachment to gain and our aversion to loss, we might see that both can cause anxiety." I'm in the midst of so much uncertainty, and these words remind me that it is all fine. You are living this, Sandra, on razor's edge of practice. Or we should say on the lava's edge. I like the concept of fierce grace. Grace is not always soft and cuddly. It is sometimes devastating and terrifying. My heart goes out to you and all those affected by the volcanic activity. You are a shining model to the rest of us on how to deal with traumatic stress. Thank you for taking the time to stop by, and I'm glad the reminder was helpful to you. Loved this, Galen - a very clear and far less ambiguous chapter for me.When you say 'consider the effort it takes to maintain our disequilibrium' - well that really sums up the harm and stress in habitual attachment and aversion tussles going on which need addressing for inner balance on a regular basis for most of us. Yes, some chapters are more elusive than others. More and more I'm aware of how, for so many years, I expended such an enormous amount of energy to maintain my delusion of control over my life! It was exhausting, and incredibly stressful. I had no idea until I stopped! Thanks for commenting, Lynne. There are quite a few links between the Tao and the teachings of Jesus, but I'm unaware of the particular comparison you are suggesting. Have a go at it, CW! The I Ching, like the Tao Te Ching, is full of wisdom. The I Ching is most well known for its use as an oracle. Did you use it that way? I'm glad you are enjoying my series of posts on the Tao Te Ching, DJan. And I smiled at your example of gain and loss on the scale! As for your blog, it's one of my favorites! "There is a point of equipoise where the self remains balanced, not seeking to force or interfere." This is Tao living, living in balance. Being content with what is, this is our greatest wealth. Artificial wealth will rise and fall like the daily stock markets.That which would excite or agitate us comes and goes. When we realize who we really are, the deeper Self, the observer of life, we can live without strong attachments to what is happening or not happening, without total identification with body, thoughts and emotions. Then, we can enjoy living in the flow of life without concern for outcome.Having less opinions and judgements we observe life as phenomenon that come and go. We live now, accepting what is, with gratitude. When we experience loss it becomes a time of growth in which we learn to detach from all that is not essential.When we experience gain we know it is temporal. To be nobody is better then fame, with fame and being a somebody comes external expectations and stress. 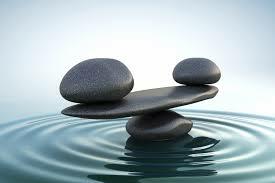 Balance and living from the center core of being seems to be what Tao is speaking to us. Beautifully said, Brian. Thank you for adding your reflections here. Your comment is valuable and valued. Comment moderation is enabled to block spam, so please excuse the delay until your comment appears on the blog.